Fox River is well-known among outdoor enthusiasts and military personnel for their high-quality products–they even have tactical boot socks designed specifically for military personnel! Fox River is an American company that was founded in Osage, Iowa. Since 1900, they have remained true to their roots, stood behind their long-held beliefs, and continuously produced high-quality products while standing behind their beliefs. Fox River prides themselves in their American-made socks and strives to limit their environmental impact. They are well-known for their Sock Monkey collection—which you may recognize as their trademarked red-heeled socks. Their patriotism is also evident in their military sock collection, which are comfortable and durable socks specifically tailored for military personnel. In this update, we added the Sport Tab Lightweight Ankle Running socks to this buying guide. This option is lightweight, comfortable, and durable despite being nice and thing because they're designed for running. We also rewrote the criteria section with more information about this great company that has high ideals and proves it through their community service work and use of environmentally sound practices. These lightweight athletic socks are more specialized for running. Women find the signature Helix Fit System and cushioning improve comfort in these socks but they do not work well with exceptionally wide or narrow feet. The TENCEL fibers and ventilated design offer superior moisture management. These lightweight socks are made from 53% nylon, 16% TENCEL®, 16% polyester, 12% NanoGlide® nylon, 3% spandex Fox River’s patented Tencel fibers. The Helix Fit System provides foot-forming compression around the arch and top of the foot. Cushioning is placed at the heel and toe of the sock with vented panels across the top. This offers some increased durability and protection where you need it without sacrificing breathability. Most women find the cushioning and full-foot helix fit system to be comfortable and supportive. The snug fit stays in place and the socks remain lightweight and breathable throughout exercise. However, a few reviewers with wider or narrower feet did not feel the fit worked as well for them. The TENCEL fibers sourced from Eucalyptus disperse moisture quickly to keep feet cool and dry. The Women’s Vite Lx is available in white and black with bright neon accents. The cut is a little bit higher than typical no show women’s socks, so, expect this sock to peak up a bit over your trainers. These socks are only sold by the pair and may seem more expensive than those bought in bulk. However, they are at the lower price range of specialized athletic socks and the durable fibers and contoured fit help justify the cost. The Peak Velox is a solid athletic sock for those seeking maximum padding and comfort. Runners note comfortable support from the Helix Fit Compression System and significant cushioning in the heel and toe. Some runners do find them a bit too thick and overly-padded compared to standard lightweight running socks but they still remain breathable and keep feet dry. The peak velox socks are made with a blend of 45% Nylon, 19% Tencel, 19% Polyester, 14% NanoGlide Nylon and 3% Spandex. The helix fit provides some compression throughout and the socks feature additional cushioning at the toe and heel. Vented panels along the side provide breathability for these thicker socks. The Helix Fit System provides volumetric compression that users find comfortable and supportive. The thicker cushioning at the heel and toe is somewhat divisive for athletes. The padding is a bit more noticeable than typical running socks. Some users find this great for shock absorption during gym workouts but some runners find it makes the socks feel heavy. Nylon, TENCEL and Polyester all have moisture wicking properties that help keep your feet dry when you start to sweat. These socks are available in black and white with bright accent colors available. They do have a higher cut at the ankle and will show over running shoes. Price may range based on style. For those seeking an athletic sock with maximum padding, this is a great value. However, athletes seeking lightweight versatility will not find these worth investing in. The Verso Ankle sock is a great sock for athletes and runners. It is comfortable, breathable, and highly durable. They feature a secure, compressed fit and will help prevent chafing and blisters from forming. These socks are made with Nylon Tencel, Polyester, NanoGlide nylon, and spandex. For increased durability, they have additional reinforcement in the heel and toe portion of the socks. These socks utilize TENCEL fibers increased comfort, enhanced performance, and maximum moisture control. This allows them to keep you cool and dry during your runs or workouts. They also feature NanoGlide technology which minimizes the occurrence of heat friction and also increases their overall durability. The NanoGlide PTFE also provides odor prevention, which allows your socks to last much longer. These socks also feature vented panels to provide maximum breathability. Lastly, their HelixFit system gives you a secure and fitted sock that will provide you with maximum support and stability. The use of TENCEL fibers allows for maximum moisture control. These ankle socks have a typical athletic design and come in 5 different color options. These socks are a bit pricier, but given their durability and additional features and benefits, it is well worth the price. These are a running specific option from Fox River. They're thin and lightweight but have a cushioned heel for comfort and durability. The material blend makes them breathable as well as tough, and users loved them. The extra cushioning found in the soles of these help your feet to continue feeling good even after many miles of running. These are made from a blend of several different fibers. They're 75% polyester for breathability, 23% nylon making them durable, and 2% spandex to help them conform to the shape of your foot and maintain that shape over the life of the sock. Almost all Fox River socks are known for this factor and these are no different. In fact, the thinness of the fabric, as well as the high percentage of polyester in the blend, ensure a high-level of moisture wicking ability. The 23% nylon in the material blend helps make these tough, even though they are quite thin. Since the cut and design doesn't utilize a lot of materials, Fox River is able to offer these for a cheaper price than a lot of their other products. These over the calf socks are comfortable, moisture-wicking, and highly durable. They are perfect for the cool weather that's upon us and perfect to wear on your favorite hikes. These socks are made of Acrylic, fit over the calf, and have a reinforced heel and toe. These socks are really comfortable, breathable, and have their flat toe seam prevents irritation from occurring. These socks use Fox River's moisture-wicking technology to ensure stay cool, dry, and comfortable. This tech also prevents blisters and irritation from occurring. These fit over the calf so they are definitely high socks. As far as value, these socks are some of the most affordable and are definitely worth the cost especially with how durable they actually are. These are thick, cozy socks that keep feet warm while still remaining breathable. They work well for outdoor activities and reviewers love wearing them indoors during the winter. However, they are not as well suited for hiking or running as they do not wick moisture quite as well as some other options. The heavyweight material hits at the midcalf and is made of 65% acrylic, 20% worsted wool, 14% stretch nylon and 1% spandex. These socks are warm and cozy without stifling your feet. The thick acrylic and wool material provides padding but remains breathable during exertion. The wool in these socks absorbs moisture without making feet feel damp. Similar to Fox River’s iconic Monkey Socks these socks have a neutral heathered look with blocks of color at the toe, heel and cuff. These socks are fairly inexpensive for solid thermal socks. The Ridgeline Quarter Crew Socks provide lightweight comfort for hiking. An effective blend of Nylon, TENCEL and Merino Wool creates the ideal balance between softness and grip in your hiking boots. The fabric blend also breathes well and wicks moisture away from feet to keep you comfortable through your hike. These socks also feature Fox River’s trademarked Helix Fit system, which provides volumetric compression around the calf and foot for improved circulation and fit. These lightweight quarter hiking socks are constructed of 45% nylon, 26% TENCEL, 26% Merino wool, and 3% spandex. The trademark Helix fit system provides compression and support while cushioned soles help to absorb shock. Flat toe seams and ventilated panels help you avoid blisters. Hikers appreciate the fine balance of materials in these quarter crew socks. They have the thermoregulation and breathability of merino wool with more elasticity and structure provided by the nylon and TENCEL. Cushioned soles and smooth toe seams are perfectly suited for hiking. The Helix Fit System provides volumetric compression that wraps around the calf and foot to fit snugly and stay in place. High percentages of TENCEL and nylon help manage moisture while the addition of merino wool and ventilated panels maintain breathability. These crew cut socks are available in gray with dark red, blue, black and brown accent colors. The dark colors will not stain easily or stand out much on the trail. Price may range but these are fairly inexpensive compared to many hiking socks. Some users note some loss in elasticity around the cuff after a few washes but most find these socks are very durable. These lightweight crew socks area versatile option for women that are lightweight, comfortable and breathable. If you are looking for a pair of socks that you can use for multiple activities, then these are it. These socks are made of 53% Polyester, 45% Nylon, and 2% Spandex. The utilize the company's URfit™ System, to ensure you get a personalized contour fit for your foot. Their URfit™ System ensures you get personalized comfort and their UltraSpun Polyester ensures you get a secure fit and also increases the socks durability and life. These socks utilize ultraspun polyester, which increases the overall moisture-wicking capabilities of these socks. These crew socks fit a high and they don't come in color options. These are pretty affordable and comes with a one year warranty. The Fox River Wick Dry CoolMax Liner socks is a lightweight, comfortable, and breathable liner sock used as a layer beneath your hiking sock. They will help keep your feet cool and dry as well as ensure you can make the most out of your hikes. These thin liner socks are made with 93% CoolMax Polyester, 6% Nylon, and 1% Spandex. They are lightweight and meant to be worn underneath your hiking socks. These thin and lightweight liner socks will help keep your feet cool and dry during your hikes. They help prevent and control any foot odor you may develop as well as any irritation, blisters, or chafing from occurring. They are thin, so they will not affect the fit of your hiking boots or shoes nor will they affect the fit of your hiking socks. These socks consistently repel moisture from your feet--to keep you cool and dry during all of your hikes. While these socks are not at all stylish, they will be hidden beneath your hiking socks--so you don't have to worry about putting them on display. These liner socks are moderately priced. They are great for those of you who excessively sweat or develop odor. They are also helpful for those of you who often chafe or develop blisters or some form of irritation. If these aren't concerns for you then you may want to stick to just the hiking socks and avoid the additional cost of these liners. These socks offer significantly more cushioning than a typical running sock. For runners or gym-goers seeking more padding to absorb shock and cradle feet, these are a great option. They dry quickly and provide support and comfort for a variety of activities. These socks are made of the trademark Coolmax polyester and offer arch support with the URfit system. Vented panels enhance breathability with cushioning at the sole and toe to absorb shock. Most men are surprised by the difference slightly thicker cushioning makes in comfort. These socks dry quickly and the soft material works well to prevent blisters during long runs. The UR fit system provides comfortable compression through the arch. The ribbed cuff and spandex compression zones prevent these socks from bunching or slipping. Fox River’s trademark Coolmax polyester provides superior moisture wicking and a quick-dry time. 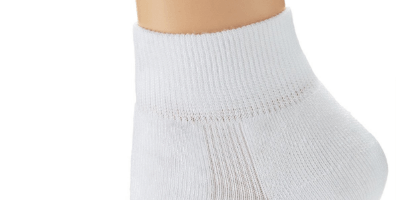 These quarter inch crew socks appear quite plain and are available only in white. Some men wish they were available in alternative colors to prevent stains from trail running. These socks ride the line between specialized sports socks and socks for everyday wear. If you are seeking cushioned socks that will work well for running or triathlons, these are a great value compared with other specialty brands. However, men choosing these socks for work or everyday wear feel the price is a bit steep compared to those available in value packs. Fox River got their start making socks all the way back in 1900. At first, they just wanted to create durable, comfortable socks for lumberjacks and other explorers. Fast forward to today, almost 120 years later, and they still make some of the longest-lasting and most comfortable socks out there. All of their products are proudly and well-made in their state of the art facility in Osage, Iowa, USA. They take pride in how comfortable their socks are, whether you choose a model for running, hiking, the summer, winter, or one of their liners which are thin and meant to be worn underneath another pair of socks for extra warmth and comfort. There are several things that make Fox River socks some of the most comfortable on the market. They consistently use top of the line materials that are plush and feel great against your skin. They also spend a lot of time designing socks that won't chafe and have seams that lie flat in places that won't cause blisters and hot spots. Notably, in 2000 they launched the sock industry's first female specific line of socks which have small toe and heel boxes to fit the unique shape and characteristics of a woman's foot. Fox River socks cater to a range of activities and occupations. With over 100 years of experience in sock manufacturing, they have developed fibers and construction techniques to suit any purpose. - Acrylic. This is a synthetic fiber that provides lightweight softness and warmth to any fabric. It is very durable and takes on bright colors easily. - Coolmax Polyester. This is one of Fox River’s trademark fibers. Polyester is synthetic and this Coolmax variety is designed to move moisture to the surface of the fabric for quicker evaporation. This technology offers quicker drying times and effective moisture management in your socks. -Nylon. Most socks have at least some of this in their blend. It is strong and versatile. Nylon can be very thin and soft, as seen in many liners, or, elastic and bulky, as in cold weather socks. Toe and heel areas enforced with nylon can also improve durability. - Polypropylene. This is another synthetic fiber with plastic-like properties. It is very strong, stain resistant, and effectively repels water to prevent socks from becoming saturated. The strong, multifilament yarn can create a thin but effective barrier against abrasions. - Spandex. Small amounts of this fabric are found in many socks to offer some elasticity. The presence of spandex can help with flexibility and compression and can also prevent socks from losing their shape. - TENCEL is another trademark fiber that is made from natural, sustainable eucalyptus cellulosic fiber. It disperses water vapor quickly to allow for speedy evaporation and quick drying times. The inherent properties also inhibit bacteria growth and will not take on odor as quickly as other materials. - Worsted wool has longer length fibers than regular wool. These longer fibers are aligned parallel to each other for improved strength, softness, and durability. In addition, worsted wool continues to offer the same thermoregulation, odor reduction and moisture control as regular wool. Moisture wicking materials are especially important when it comes to footwear. Damp socks and sweaty feet can increase friction as you walk or run, increasing the likelihood of developing blisters and hot spots. Socks that can manage moisture will reduce friction, helping you stay on the trail longer. Fox River uses a variety of fibers in their socks that can help wick moisture away. Many of their socks also feature their signature Wick Dry technology that was introduced back in 1985. This technology weaves together hydrophobic (water repelling) and hydrophillic (water absorbing) yarns to move moisture to the surface for quicker evaporation. While many Fox River socks are thicker than typical running socks many avid runners love to use them for how well they wick moisture away from the foot, which is an ideal quality in a pair of running socks. If you choose a pair to run in, we recommend getting one of their thinner options. Regardless, we know that many of our readers, besides being avid runners, also love to hike, camp, hunt, and participate in other outdoor activities, so we wanted to create this buying guide to help you choose the most appropriate pair of socks from this great company, no matter what activity you plan on using them for. This is a factor that Fox River is known for. Their product's excellent design, their use of high-quality materials, and their high standard of craftsmanship all combine to make a great pair of socks that will last you a long time. This company wouldn't have been in business for almost 120 years, which actually makes the the United States' oldest sock company, if their products didn't stand the test of time. Going back to some of the factors we've already mentioned, their use of excellent materials, intelligent design, and solid craftsmanship all combine to create socks that will go the distance, just like you. In fact, if you buy a pair of Fox River socks, either directly from them or through another retailer, and you aren't completely satisfied for any reason, you can return them to the company and they will send you a new pair for free. It's that time of commitment to quality that made us want to bring you a buying guide dedicated to their socks even though they aren't strictly a running sock company. For those of us who were lucky enough to have awesome grandparents, we probably remember how on birthdays and holidays they would often times give us a pair of nice socks instead of the toy we really thought we wanted. Well, it turns out that, as usual, grandma and grandpa really knew what they were doing. You see, our feet are a super important part of our bodies, especially for us runners, and if we take care of our feet they'll take good care of us. A good pair of socks is a great way to take good care of your feet because they will help prevent the hot spots, blisters, and general soreness that can really throw you off your game. So when your grandparents gave you that pair of high-quality socks, they were really looking out for your best interests because they knew what was best for you. Nowadays you can buy socks really cheaply and it's easy to get 3 or even 6 pairs for the same price as a single pair of high-quality socks like those offered by Fox River. But you'll find that with those cheap socks you'll get what you pay for, and probably sooner than later, you'll be trashing them, rubbing your sore feet, and wishing you'd just invested in a pair or three of socks from Fox River or another high-quality manufacturer. Don't worry though, Fox River socks won't break your wallet and are still less expensive than some options from other companies. The best summertime socks are those that wick away moisture which keeps your feet cooler. The cooler your feet the less friction from perspiration, which helps prevent blisters. This may sound counterintuitive, but wool socks can actually be some of the best for the heat of summer because they offer better moisture and heat management than most synthetic fibers. The obvious one here is heat retention to stay warm. Winter socks should still wick away moisture just like summertime socks. Even a little bit of sweat next to your skin in cold weather can quickly cause them to get cold and even in cause frostbite in extreme cases. Generally you will want thicker socks but it is important that they aren't too tight, otherwise, this will restrict circulation and your feet will get cold faster. Fox River has two trademark fit systems that enhance comfort and performance. The Helix Fit System seen in the Peak, Velox and Vite socks utilizes volumetric compression that wraps around the foot and the calf to improve the fit and circulation. This system reduces the amount of fabric used to provide a snug fit that will stay in place. Anti-slip anchor areas at the heel and arch prevent socks from sliding or bunching. A Y-seam at the heel pocket maintains ankle flexibility and stretch. The URFit system used in the Dry Quick Triathlon socks has additional features to improve fit and feel. Spandex compression zones add support and prevent slippage. A contoured rib cuff gently holds socks around the calf so they will not slide down. Memory-knit construction helps socks maintain their shape through wear and washing. Most socks also feature flat toe seams with a barely noticeable feel. These smooth seams do not cause chafing and reduce irritation on the top of the foot. You can spend hours scouring reviews and lists for the perfect socks. However, even the most comfortable sock may become uncomfortable in the wrong shoes. Particularly for activities that will have you on your feet for long periods of time, finding a sock that fits properly with your shoe is vital for comfort and blister prevention. In cold weather shoes that are too tight will actually make feet colder faster so be sure to choose socks and shoes that allow the toes to move. Fox River socks are designed for a variety of activities. Whether you are seeking a versatile everyday sock or a specialized hiking liner, they have a sock designed specifically for that. Activity-specific socks will manage moisture to reduce blisters. They also may feature some areas of compression and/or reinforcement to improve comfort and durability as you move through the task at hand. Consider what you will be needing your socks for most and read reviews specific to that activity. In warm weather moisture wicking socks are a must and will actually keep feet cooler than skipping socks all together. Colder temperatures can also benefit from moisture wicking as dry feet will stay warmer. Wool is a great fiber for thermoregulation and thicker knits can effectively insulate feet. Fox River tends to value functionality over fashion but some of their newer socks are available in fun patterns we are accustomed to seeing in activewear. As far as outdoor gear, they do offer classic styles and dark, neutral colors that look cozy and will not detract from any outfit. q: How do I care for my Fox River socks? The company recommends turning socks inside out before machine washing in warm water without bleach. Then tumble dry on low. q: Where are Fox River socks made? All Fox River products are made in their 250,000 square foot, state of the art production facility in Osage Iowa, USA. q: Is there a difference between men’s and women’s socks? Unless specified, the socks on this list are unisex. Fox River does make some options specifically for women that run smaller and have a narrower toe box and heel pocket to better fit a woman’s foot. They were actually the first sock company in the world to make a sock that is specifically for women, just one of many innovations they've made over the years. q: Are Fox River socks good for running? They can be. Like most other things this depends on the unique characteristics and preferences of each runner. Most Fox River socks are thicker than the typical running socks. In lesser quality socks thickness can more easily cause hot spots and calluses than thinner options. However, because of the intelligent design, thoughtful seam placement, and high-quality materials that Fox River uses they can in fact be great for runners who prefer using a thicker sock. If you've never tried one of their products, we recommend buying a pair that interests you and trying them out. Even if they don't end being the best for your running style, you'll still be assured of having a great new pair of socks that's perfect for hiking, camping, or other outdoor activities.